Today, analysts must manage data characterized by extraordinary variety, velocity, and volume. Using the open source Pandas library, you can use Python to rapidly automate and perform virtually any data analysis task, no matter how large or complex. Pandas can help you ensure the veracity of your data, visualize it for effective decision-making, and reliably reproduce analyses across multiple datasets. 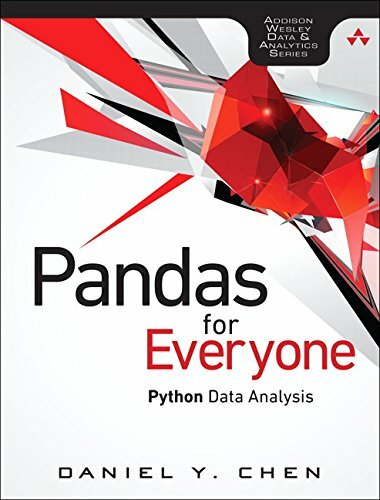 Pandas for Everyone brings together practical knowledge and insight for solving real problems with Pandas, even if you’re new to Python data analysis. Daniel Y. Chen introduces key concepts through simple but practical examples, incrementally building on them to solve more difficult, real-world problems. Chen gives you a jumpstart on using Pandas with a realistic dataset and covers combining datasets, handling missing data, and structuring datasets for easier analysis and visualization. He demonstrates powerful data cleaning techniques, from basic string manipulation to applying functions simultaneously across dataframes. Once your data is ready, Chen guides you through fitting models for prediction, clustering, inference, and exploration. He provides tips on performance and scalability, and introduces you to the wider Python data analysis ecosystem.